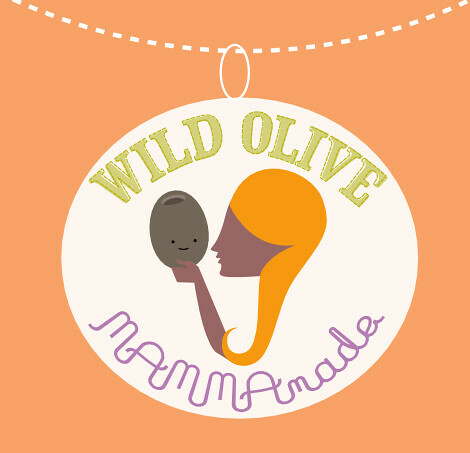 You'll soon be able to make dresses with Wild Olive designs on them! What? For real! 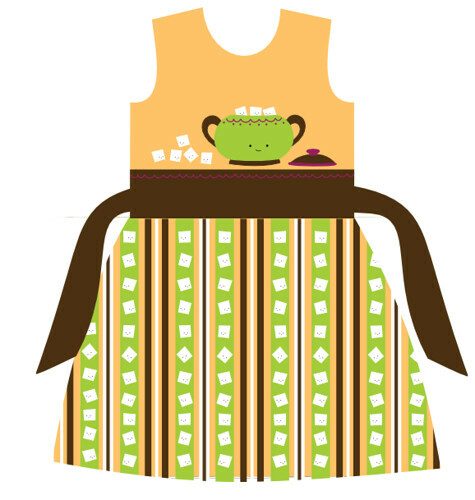 I have teamed up with Rachel of Mamma Made, and have been working on designs for some tea party dress kits, which you sew up yourself. Actually, Rachel has done the designing, I've just done the illustrating. You can read all about the process over on Rachel's blog, and what's even better...you can win one of these dress kits! Okay, I'm all calmed down. Seriously, this has been such an amazing thing so far. I never would have thought about doing something like on my own, and I was beyond thrilled with Rachel agreed to do one dress, let alone a collection. Thank you, Rachel! Now, go over to Rachel's blog, enter to win a dress, and be sure to check out all of the other wonderful things she has going on. Wow, that's soooooo exciting! I absolutely LOVE the green and yellow one! They are beautiful!!! The spoon one is my favorite. Dress #5, sweet treats is what I'm voting for! I love #2, the teaspoon dress. I love that shade of green. Love Dress #5 -- Would look great on my niece -- her dad owns a bakery! What a wonderful collaboration you two have come up with! They are all so cute, it’s hard to pick just one favorite. If I HAD to choose just one, I think it would have to be the Spoons dress. Wow! There's almost too much cuteness for words! These are all so adorable. I love the Tea Party one with the orange. So cute. we've had fun visiting your blog this week! we love tea parties at our house! our favorite dress is the teaspoons!!! but it was a hard choice, truthfully! those sweets! I have really been enjoying your tea party this week! What a great idea! 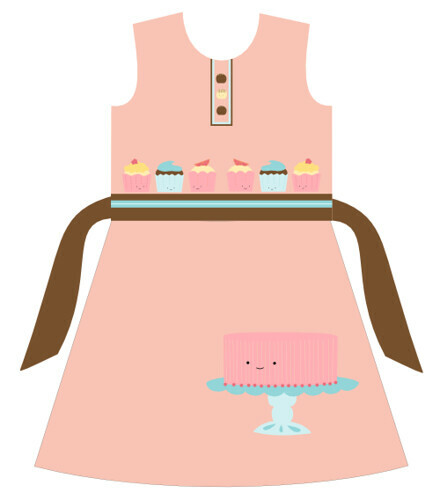 Those dresses are all so adorable, but I think that the #5-sweet treats is my favorite. Congrats! I love the first one! This is fantastic! I love love the #1 tea party! Cute! I love #2- Tea Spoons! Love the spoons going around the skirt! The dresses are beautiful, and your designs are wonderful! My favorite is the Tea Party--I love the two shades of orange with that blue. I LOVE #5! So cute! How exciting for you! I LOVE the cupcake one! Sweet Treats is so cute as I like cupcakes and pink!! All are adorable!!! What an ingenious idea! soo sweet and cute! And hard to choose my favourite, but I'd most drawn to #5. Pale pink and brown are just made for eachother! I do love how your Tea Party idea just exploded. How wonderful to have collaboration. Now my favorite is "teaspoons"
I think they are all cute, but my little one would love Sweet Treats. It would be perfect for her summer birthday! I love blue sugar especially as there are not enough blue dresses out there for girls with lovely blue eyes. I adore "Sweet Treats"! It would be so precious on my baby niece! Alisha jasongravette at aol dot com. i like them all, but blue sugar and the first one are my favorites! Man oh man these are ADORABLE!! So cute!! So creative. Spoonflower is fantastic, wish I could draw and design, but alas. I'll be purchasing some of these. Oh wow! Love blue sugar, would be perfect for my niece who loves dresses but has far too many pink ones! They are all amazing, but 2. is my favorite. by the 1st one. I love all of them!!! Ohmygosh - congrats, Mollie!! what awesome & exciting news! :) They're too-cute-for-words! I love love love #5, Sweet Treats! 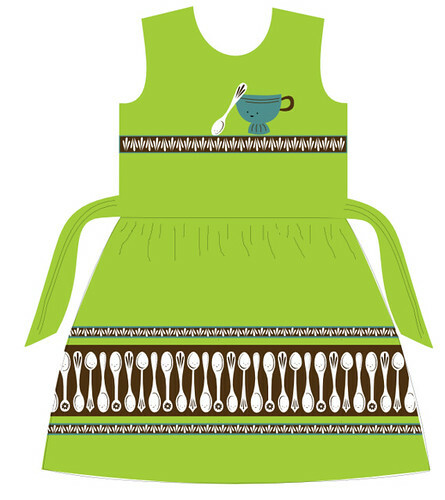 Gail Goodhand I would love to win the #2 Tea spoon dress kit, It would look great on my grand niece. So cute! I like the Blue Sugar best. Congrats on such a great collaboration, the designs are all fabulous! My choice would be the tea party dress for a granddaughter in love with orange. #5 sweet treats is my favorite! Love it! So very cute! I love them all. My daughters and I just love this idea! Sweet Treats is our favorite. I like Tea Spoons best! number 5 is my favorite!!! Thank you for doing a giveaway. I can't wait to buy one! Sooooo in love with the pink one. All those scrumptious cupcakes! LOve these!! I especially love #1 and #2. They are all just too cute though! I love them all but my fave is the yellow sugar one. I can't wait to make these for my twin girls! My favorite is "sweet treats". I really like all of them, but my favorite is Tea Spoons! You two are really a totally winning combination. Now if I were to ask my granddaughter she would say the pink one but after looking and looking and looking again my favorite is the two-tone orange one - think it's called Tea Time. Thanks for the chance to win this. 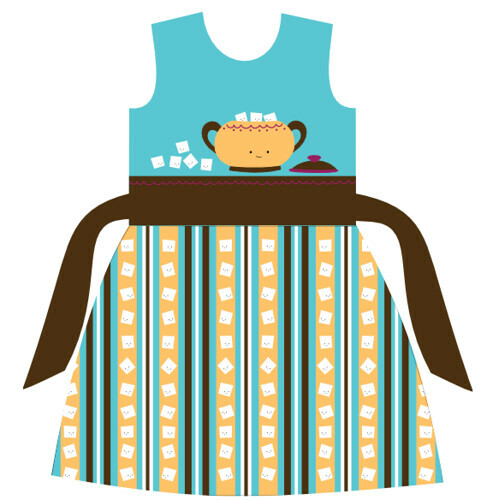 I love the sweet treats dress! they are all so adorable! thank you! my favorite is definitely #2. green & black & spoons. too cute. Hello. A lovely collaboration. 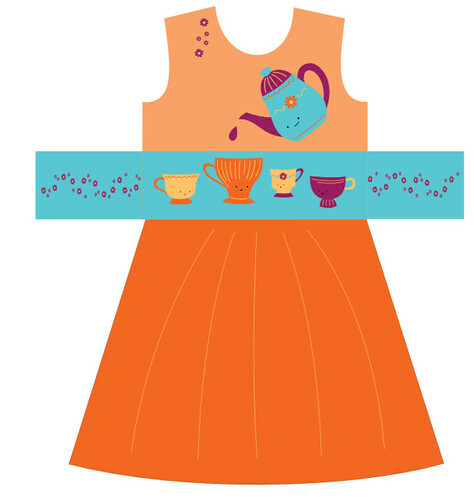 I love the orange tea party dress. It is super sweet and looks tres easy for a novice like me. I LOVE LOVE LOVE DRESS #1. Tea Party dress ALL THE WAY! They are actually all really really cute. But that is my favorite. I love them all, but if I got to win just one, it would be #1, the original tea party design. These are too wonderful!